When King Wenceslas IV died in August 1419, he was succeded by his brother Sigismund, King of Hungary. However, the Czech people, who held him responsible for the death of Jean Hus, refused to accept his claim to the throne. With the support of the Catholic Church and the German army, Sigismund launched a crusade against the Hussite movement and succeeded in occupying Prague Castle where he was crowned king. In July 1420, the Hussites challenged Sigismund at Vítkov Hill on the outskirts of Prague. Led by their military leader Jan Žižka, the army of Hussite followers was joined by Czech soldiers from Prague who launched a surprise attack from the rear. Together, they succeeded in overpowering Sigismund and his men, forcing their retreat and Sigismund’s abdication. 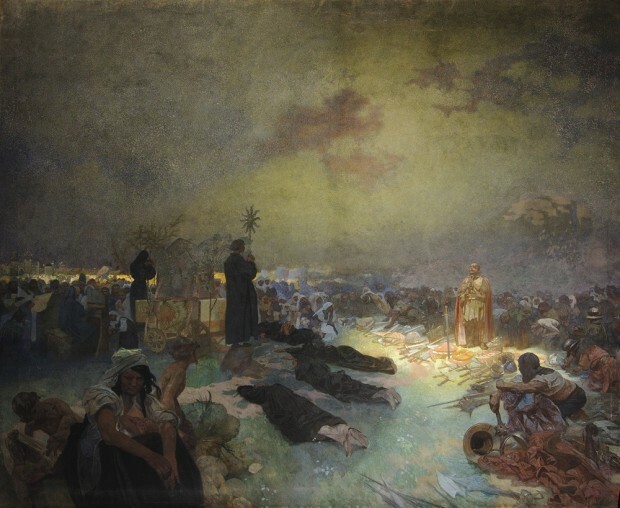 Mucha’s theatrical composition portrays the solemn mass given by the priest that led the Czech soldiers from Prague. Holding a monstrance, he is surrounded by clergy lying in supplication on the ground. The rising sun penetrates the clouds and casts a celestial spotlight on the figure of Žižka, the victorious leader, who stands to the right of the composition with the weapons of the conquered army at his feet. A mother nursing her child in the bottom left of the painting turns her back on the religious celebration, no doubt aware that her people will suffer further bloodshed as the Hussite Wars continue. Painted in 1916 as Europe was fighting in the trenches, this painting carries a personal commentary on the horrors of war.